Happy 2nd Anniversary to ThrewRedButter!!!!! As always, thank you to those who have stuck it out since Dale's Pale Ale. So...wow...two years. I try to make it a point to break out something special from the collection for landmark occasions. If I do say so myself, I think I chose a nice one. Firestone Walker's Proprietor's Series has an aura of greatness. This series of barrel-aged beers are among the best in their respective style. Originally released in 2011, Abacus (now called Sucaba due to legal reasons) is an English Barleywine aged in multiple bourbon barrels. Only the 2011 batch saw the Abacus name on the label, but its been five years, so I think it is time we put this baby to good use. "Confoundingly unpronounceable yet eminently drinkable—welcome to §ucaba, an epic barrel-­aged English barley wine whose original name was undone by a two­‐bit legal challenge. Big, boozy bourbon and American oak aromas combine with soft chocolate malty undertones. Complex malt ﬂavors are framed in oak with hints of dark chocolate, vanilla, tobacco, coconut and just a touch of dark cherry. §ucaba is built to last and can age for years to come (we recommend counting the years with an abacus)." Pours ruby red in the glass and the pour produced absolutely no head. The aroma is still boozy after five years, but is a refined booziness and not a stinging, alcoholic mess. After that is a lot of sweet, sticky bourbon, sweeter malts, caramel, toffee, butterscotch, and oak. I had some concerns going into this that maybe some oxidation may have reared its ugly head after half a decade, but I am elated at the fact there is no infection in my bottle and everything tastes sublime. A nice rush of malts hit me first which change on a dime to the heavy bourbon presence which has lasted through all of the years. The barrel is also lending a lot of oak and char to this with almost a smokey quality. The aforementioned notes of caramel and butterscotch are here at an unrelenting pace with those malts constantly adding to each flavor. Deep in the back are some cherries and some minor bits of alcohol. I keep getting this other sugary flavor that I can't put my finger on, but the closest thing I can compare it to would be honey or even a marzipan flavor. In terms of mouthfeel, the body is thick with a syrupy presence, but without being too thick or syrupy (if that makes sense). The malt presence makes for a somewhat drying experience, but it is by no means a desert in my mouth, The malts (again with these things) are everywhere and they are they are last thing to linger on the tongue on each sip. The bourbon and those smokey char qualities also stick around. Speaking of sticky (if I had a nickel), I am smacking my lips with each sip of the glass. Again there is some minor booziness, but overall you can't taste the 13% and you don't really get a warming sensation. 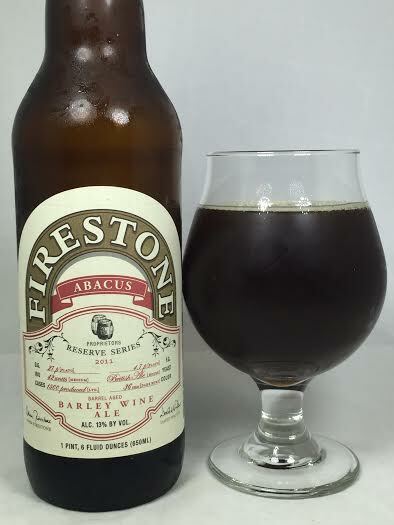 Abacus has the same great flavors and aromas as any variation of Firestone Walker's Sucaba. Does the five years of aging really turn the beer into another beast? I would personally say not really, but that in no way, shape, or form takes away the fact that this is a superb barrel-aged English Barleywine. Incredibly sweet, soaked in bourbon, and retaining all of the oak characters from the barrel, this is just another shining example of Firestone Walker's barrel-aging program. In year's past, this was a component in the FW Anniversary Ales, but this is world class on its own and one of the best English Barelywines I've ever had. Here's to two more (hopefully more) years of excellent beer.